A version of this article was originally published in the Journal of the Royal Institution of Cornwall , 2009. The surviving evidence of pre-Reformation stained glass in Cornish churches is mostly very fragmented, in most cases literally so, rendering any general conclusions extremely suspect unless they are corroborated by evidence from windows of a similar age in other counties. Figure 1. Lanteglos-by-Camelford: Saints James the Great, Andrew and Peter. Some of the earliest panels of stained glass are at Lanteglos-by-Camelford, where a sequence of saints survives in the tracery of the south wall windows. The Lady Chapel tracery includes images of Joanna and Mary Salome: presumably as part of a sequence in the Chapel which originally included images of the Blessed Virgin that have not survived. The South Aisle sequence, starting with St Peter, (Figure 1) can be read as an affirmation of the Catholic apostolic succession,3 but the later destruction of the main lights below gives no clue as to how they might have been integrated into the iconography of the whole window scheme. Similarly, at Lanteglos-by-Fowey, there is a tracery survival in the Lady Chapel of the Annunciation and Coronation of the Blessed Virgin Mary, making this window an even more remarkable survival of the iconoclasts. St Neot, St Kew and St Winnow are the only churches containing complete pre-Reformation windows, all inserted around 1500. Even these windows are not necessarily in their original format or position, and those at St Kew and St Winnow are probably composite windows made up from the glass of more than one original window. Figure 2. St Kew: betrayal of Christ. Figure 3. St Neot: Noah’s Ark. Figure 4. St Neot: legend of St Neot. Besides illuminating and reinforcing the theological and doctrinal philosophies of the Catholic Church and relating biblical and other narratives, the windows were also indicators of the significance of patronage within their communities. In one case, at St Neot, the actual maker of the window is recorded as the donor figure.6 On the same north wall, other windows were donated by the medieval guilds that played such an important part in supporting the pre-Reformation parish church.7 Stained glass has always been an expensive artistic medium, and in most of these late medieval windows the donors were included as actual figures kneeling at prayer or by armorial symbols. At St Winnow (Lady Chapel east), both the Courteney and Archdekne heads of the families were prominently displayed at prayer, although probably they are not in their original position within the windows. 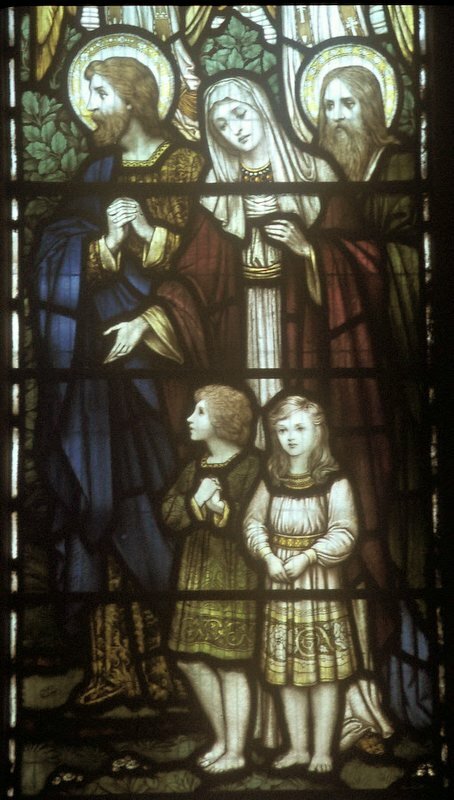 Often the whole donor family was portrayed, as in the Borlase south chapel window at St Neot, where the parents are accompanied by four sons and six daughters. Not only was the actual representation of the donor a statement of status within the community, but it was also a statement of possession or ownership of that part of the building where the window was sited. This is true of the Courteney and Archdekne window in the Lady Chapel of St Winnow (Figure 5) and the Pentire and Carminow window in the Lady Chapel of St Kew. Figure 5. St Winnow: Archdekne donor. Although the scarcity of pre-Reformation stained glass in Cornwall makes any broad generalisations difficult, there is enough evidence to suggest that such windows fulfilled a number of functions within the social context of these communities, and indeed these functions reappear in the stained glass of later centuries. From the Church’s viewpoint they educated the largely illiterate laity and reinforced doctrine. Like many other features in the churches of the late Middle Ages, the stained glass windows with their altars beneath them were inserted with piety as images of devotion. The donor families were seen by the contemporary congregation to be a presence in the windows as physical figures and in symbolic armorials, whilst establishing a defined space for themselves within the building. The same can be said for the sponsorship of windows by the medieval guilds, representing as they did a significant portion of the community. Following the iconoclasm of the Reformation and the later Civil War, the insertion of stained glass windows in Cornwall’s churches practically ceased for over two hundred years. Earlier windows were largely deliberately destroyed or allowed to decay, so that today ninety per cent of the pre-Reformation glass has disappeared.8 The new plain or tinted glass windows of the Church of England deliberately contained no colour or pictorial representation, and consequently the craft of stained glass making gradually vanished over most of the country. The production of visual expressions of piety and devotion in stained glass and all other artistic forms ceased. In some Cornish churches, such as Altarnun, St Endellion and Ludgvan, stained glass was never inserted again. Figure 6. Cardinham: Grylls arms. There was, however, one visual feature that persisted from the earlier period, namely the enamel painted armorials of the leading families in the communities. A good example is the Grylls armorial of the eighteenth century in Cardinham church (north aisle east), where the family symbol of the porcupine was prominent in the right-hand light (Figure 6). An interesting modern version is to be found in the etched nave window inserted in 2004 at St Neot which was donated by Richard Grylls, the latest descendant.9 The family porcupine was deemed to be an essential part of that design, although it had no religious relevance to the rest of the window. Such statements of family status persisted well into the nineteenth century, after the resurgence in demand for stained glass windows in Anglican churches, as at Old Kea Church.10 The social history of this whole period is encapsulated in the Lady Chapel window at Lanteglos-by-Fowey, where the previously noted medieval Marian images in the tracery are above the 18th century arms of the Mohun family which in turn are set in the plain glass main lights characteristic of the Protestant centuries (Figure 7). Figure 7. Lanteglos-by-Fowey: Coronation and Annunciation. The revival of interest in stained glass in the early nineteenth century was a High Church response to the Tractarian Movement in Oxford and the Cambridge Camden Society (later the Ecclesiologists) in Cambridge.11 In Cornwall these influences were preceded by J.P. Hedgeland’s restoration of the medieval glass at St Neot in 1825–29 where he inserted four of his own windows designed to harmonize artistically with the existing fifteenth-century windows. The earliest Tractarian windows in Cornwall were inserted and paid for in 1843 by Revd Batty in his new church of St Paul Penzance.12 He turned to Thomas Willement, the Artist in Stained Glass to Queen Victoria, to design the windows, which were conceived in the approved mosaic style echoing earlier medieval examples. The windows had coloured geometric patterns set in grisaille backgrounds, with small roundel or mandorla figures (Figure 8). For such Tractarian priests, the main purpose for such windows was to re-establish the medieval atmosphere for Eucharistic worship. A similar response was made at Little Petherick (chancel south), where the Tractarian vicar, the Revd Sir Hugh Molesworth, was later portrayed in full Eucharistic vestments holding a model of the church in one of the stained glass windows. Similar Tractarian-inspired mosaic stained glass windows were inserted in churches built by young architects at the start of their illustrious careers: George Street at Par Biscovey and John Loughborough Pearson at Devoran.13 Both used the studio of William Wailes of Newcastle. A late example of such a window was at Kenwyn (chancel east), where in 1867 Gibbs substituted a grisaille background for a multi-coloured version of great complexity, yet still retained the small pictorial roundels and mosaic technique (Figure 9). In all such windows, the primary aim was to enhance the worshipful atmosphere of the church, particularly the chancel, and the style marked a return to the medieval sense of piety in the glazing of the church. Figure 8. Penzance St Paul: St Peter. Figure 9. Kenwyn: scenes of the life of Christ. The Established Church for the Establishment? Figure 10. Lamorran: Christ, Saints Peter and Paul. As the demand for stained glass increased in the nineteenth century, so also did the influence of the donor in both the artistic style of the window and in its subject-matter. Lord Falmouth donated two windows in 1854 to his churches at St Michael Penkevil and Lamorran. He also employed Thomas Willement to design the windows, but unlike Willement’s Tractarian designs at St Paul Penzance, the results here were windows of a style that was similar to the painted windows of the eighteenth century, down to the winged putti playing musical instruments, all presumably at the request of the donor (Figure 10). In the tracery at Penkevil the emblems of the four evangelists surrounded the sacred monogram, but the Falmouth arms figured prominently on either side. In 1846 memorial tracery lights were inserted at St Breocke (north transept north) to the Molesworth family. The family arms dominate the centre, flanked by the requisite memorial details. However, the sacred emblems of Alpha/Omega, the sacred monogram, the Star of David and the chi-rho symbol ☧ were all relegated to small cinquefoils above the main lights of plain glass. At Old Kea, as already mentioned, a two-light window of 1863 depicted the armorials of the Seton, Peebles, Murray, Daubuz, Gilbert and Vautier families. Except for a Cross in the tracery, these armorials, set in their decorative background, are the only iconographical features, and so it is difficult to read the window today as anything more than a statement of the social position and power of certain families that were connected with the local community in some form or another. 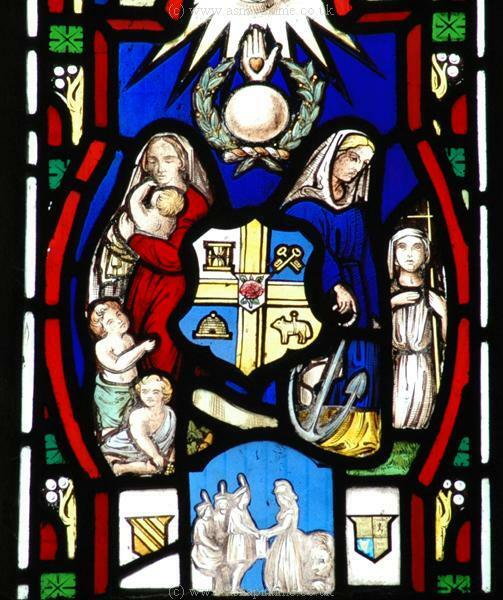 The 1864 Pendarves window at Camborne contained no fewer than twenty-nine armorials of the family and had no evident Christian iconography at all (Figure 11). It was also placed in the east window of the South Chapel, a position of high visibility to the whole congregation. In the 1886 George Farrell Remfry memorial window at Warleggan, the inscription beneath the depiction of the Crucifixion reads Patron of the church and Lord of the Manor . Figure 11. Camborne: Pendarves armorials. Two of the most spectacular examples of the display of local power and status are to be found at Kilkhampton and Maker14. In the latter the Edgcumbe arms completely fill two three-light windows in the family chapel. These were inserted when the chapel was restored in 1882, emphatically establishing the sense of family ownership of this part of the building. At Kilkhampton an extraordinary sequence of three windows, each of four lights, was inserted twenty years earlier.15 Each portrays ten ancestors of the Grenville family, complete with their noble regalia, armour or court dress, stating the family’s local and national influence over many centuries (Figure 12). These windows are on the north and south walls of the side chapels and reinforced the sense of possession by the family of that part of the building. Figure 12. Kilkhampton: Grenville memorial. The typical inscription: To the Glory of God and in (Loving) memory of … indicates the dual purpose of many such memorial windows. On the one hand the window enhanced the worshipful atmosphere of church, whilst on the other hand the windows were intended to immortalise certain aspects of the dedicatee’s memory: these purposes were not necessarily compatible.18 At a simple level, the choice of the figure of Dorcas to commemorate Mrs Manning, the vicar’s wife at Little Petherick, seems a straightforward acknowledgement of her charitable works with the poor.19 Today one reads this as the single characteristic that the vicar wished her to be remembered for by the congregation. Figure 1305. Boconnoc: Memorial to Lt Col Cyril Dudley Fortescue of the Coldstream Guards, died 1890 , showing SS Alban, George and Geraint, all wearing armour, reflecting the dedicatee’s military career. At the top of the tracery is the regimental badge of the Coldstream Guards. The arms in the tracery and at the bottom are of the Fortescue, Ryder, Leveson, Grenville and Pitt families, illustrating the history of the dedicatee’s family and the Boconnoc estate. The position of the Rector or Vicar in the local community was second only to that of the Lord of the Manor or Squire, and many clergy in the second half of the nineteenth century instigated and contributed to the restoration of their own churches. It is not therefore surprising to find that 22% of all memorial windows in Cornish churches commemorate deceased parish vicars and rectors or were donated by them to members of their families.22 The subject-matter of these memorial windows often reflected the priest’s function within the parish, with many examples of the Good Shepherd or the Sermon on the Mount. A particularly apposite subject is at St Merryn where the Revd Edward Olivey was portrayed as thou good and faithful servant 23 (Figure 13). Figure 13. St Merryn: Revd Edward Olivey. Other professional members of the community were sometimes commemorated. At Ladock the memorial window to Richard Wise M.D. was a fine 1868 William Morris south aisle east window of three figures representing healing, namely the Archangel Raphael, St Luke and St Peter. This window alone should remind the modern viewer how biblically literate the Victorians were24(Figure 14). Figure 14. Ladock: Raphael, Saints Luke and Peter. The practice of using photographic likenesses to personalise the faces of figures in windows grew during the second half of the nineteenth century, and helps us to read the subtexts of the windows. It enabled the donor families to insert themselves into biblical narratives in an intricate and complex manner. In many respects this marked a return to the medieval practice of inserting the donor figure directly into the visual image. At St Michael’s Mount a St Aubyn window showed the contemporary mother and children prominently: in one light the St Aubyn child was shown on the Virgin Mary’s lap, another appeared as the young John the Baptist with St Elizabeth, whilst the biblical narratives of the Annunciation and the Marys at the Tomb were relegated to predellas at the bottom of the window.25. The image of Christ Suffering Little Children to come unto Him was a popular one in this period, particularly in memorial windows to young children, as at St Columb Minor.26 At St Michael Penkevil (south transept east), however, Christ was surrounded with His disciples and two members of the Falmouth family, whilst five of the family’s children appeared all dressed in 1913 contemporary clothes (Figure 15). In both of these examples one can interpret this as not only the family’s appropriation of church space, but also a visual appropriation of Gospel space. Throughout the upper levels of the class structure of the Victorian and Edwardian communities of Cornwall, memorial windows therefore offer a rich field of research for social, local and family history. Figure 15. St Michael Penkevil: suffer little children. Figure 16. Mabe: Solomon and Dorcas. Figure 17. Michaelstow: St Michael. Figure 18. St Eval: Coastal Command memorial. Figure 19. Paul: First World War memorial. Figure 20. Lelant: First World War memorial. The central figure, below the royal coat of arms, is St George in armour slaying the dragon with his spear. At the top of the left-hand light are the arms of the Duchy of Cornwall, and at the top of the right-hand light the arms of the Diocese of Truro. The names of the Lelant men who died are written on the scrolls in the left- and right-hand lights. So far the evidence of Cornish social history in windows since the revival of stained glass in the 1830s has focussed on a restricted sample of the community: namely the gentry and landowners, the clergy and professionals, and the emerging Victorian middleclass. Until the end of the First World War, there are only three post-Reformation examples of windows representing the working classes. Figure 21. Padstow: fishermen’s window. In the 1850s, a Padstow window (north aisle 4) commemorating the local fishermen combined tracery elements of a ship and anchors with a very effective series of texts written on billowing sails at the head of the otherwise plain lights, including the opening of Psalm 130 Out of the depths I have cried unto Thee O Lord (Figure 21). Figure 22. Camborne: Odd Fellows. Photograph copyright © www.asnapintime.co.uk, used with permission of Ryan Smith. Figure 23. Camborne: Odd Fellows. Photograph copyright © www.asnapintime.co.uk, used with permission of Ryan Smith. At Camborne there is one window that is unique in Cornwall and probably in the whole of the south west. In 1863, a two-light window was inserted in the west of the north aisle by the Oddfellows (Figures 22 and 23). That in itself was remarkable, considering it was but thirteen years since they were declared to be a legal organisation. Perhaps the dedication, to the marriage of the Prince of Wales, made the window and its content more acceptable. The window appears to be in traditional early Victorian style—grisaille, coloured geometric patterns and small roundels. Closer inspection of these roundels, however, reveals the window’s unique character. The first roundel showed, around the Oddfellows arms, the figures of a working-class widow with three children and the figure of Hope with her anchor. 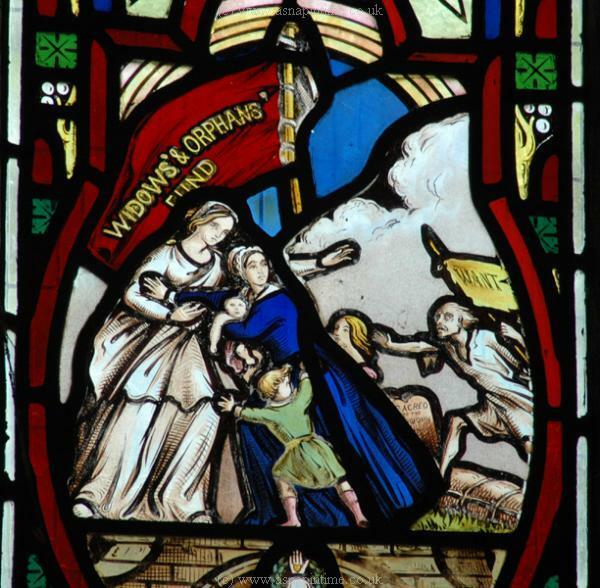 The second is even more remarkable, being a massive red banner of the ‘Widows & Orphans’ Fund held by the figure of Hope protecting a widow and three children, whilst over the grave of the dead father strides the gaunt figure of ‘Want’. This window speaks volumes about the social history of a section of the community that was so important to the Cornish economy and was otherwise totally unrepresented in Cornish windows until the twentieth century. Figure 24. St Cleer: St Margaret of Antioch. At St Cleer today there are nine small windows mounted in the south aisle.39 These were originally placed in the iron mission church at the small mining community of Draynes in 1888 (Figure 24). To have any stained glass in such a church was in itself a rarity. An editorial in Church in the West commented on this fact: We believe clergy would do well to make their churches and their services warm and bright with colour. Poor people love it. It lifts them out of unlovely surroundings .40 Sadly the church lasted less than a decade but the windows were found a new home in the neighbouring parish church. On a lighter note, a glimpse of the whole local community is found in the west window of 1884 at Quethiock. Made by the local priest, the Revd William Willimott, a prolific stained glass designer and maker, it shows the Last Judgement. The faces of the damned are remarkably lifelike, and local legend has it that the vicar included all in the village that he was at odds with, led by the pub landlord. Figure 25. Truro Cathedral: Dolcoath miners. Images of the working-class section of the community became more common in the twentieth century. Representations of the miners and fishermen of Cornwall were inserted in Clayton & Bell’s 1907 west aisle windows in Truro Cathedral (Figure 25). Symbolic images of farmers were included in Brian Thomas’s 1968 window at St Dominic (north aisle 2). Two very impressive Christian Socialist windows were made by Edward Payne at Trevone, Padstow in 1958. The Good Shepherd was portrayed as a clean-shaven weather-beaten shepherd rescuing a sheep from some particularly cruel briars, whilst at the other end of the church, Payne’s vision of Christ stilling the storm was of genuine fishermen facing a typical Cornish gale. At St Stephen-in-Brannel a Second World War memorial used the Last Supper as its main theme, but surrounded it with images of the traditional local working landscape. The clay industry sequence ends predictably with the Cornish craftsman potter, whilst the arable farming sequence ends rather incongruously with a housewife in her new fitted 1946 kitchen, presumably preparing a meal for her husband and family41 (Figure 26). Figure 26. St Stephen-in-Brannel: Second World War memorial. As the previous examples show, Cornish themes denoting a sense of pride in the county had become a common feature in windows by the mid-twentieth century. The formation of the Diocese of Truro in 1876 marked the start of this trend, and illustrated the manner in which the Anglican Church sought to re-establish itself within the fabric of Cornish society. Bishop Benson’s early diaries leave no doubt about his attitude to, as he saw it, the dangers and evils of non-conformism .42 His response was to initiate the building of the first Anglican cathedral on a new site in this country since the Reformation, to establish a Canon Missioner to revitalise parish life throughout the Diocese, and to start an ambitious programme of church building and restoration. In the latter respect Cornwall lagged badly behind the rest of the country, where Victorian restorations had often peaked in the 1850s and 1860s: in Cornwall it was a good twenty years later.43 What is the stained glass evidence for these trends? At a deeper level, the publication of the proposed scheme for the Cathedral’s stained glass windows in 1887 showed how far Bishops Benson and Wilkinson and Canon Mason were prepared to go to use stained glass in a didactic and assertive manner.48 This multi-layered scheme encompassed the basic tenets of the Christian belief, Old Testament figures and events, the Gospel narrative and, most importantly for the arguments of this paper, a survey of 1,900 years of Christian history. The interest here lies in the selection of those included, and a close analysis of the evolution of the scheme shows a deliberate emphasis on reasserting the Anglo-Catholic traditions and personages of the Church and their links with pre-Reformation traditions of doctrine.49 Woven into this sequence are a number of Cornish persons, from the pre-Augustinian saints to post-Reformation individuals covering all shades of belief from Monarchists to Puritans. It even includes the Wesley brothers when they were still priests of the Anglican church. Throughout the cathedrals and parish churches in Victorian England, the subject-matter of the overwhelming majority of memorial windows was largely influenced by the donor’s wishes. Truro’s experience is unique in that there is absolutely no evidence whatever that the donors for the windows requested any changes to the published didactic scheme for the cathedral. Figure 27. St Kew: St Kew. 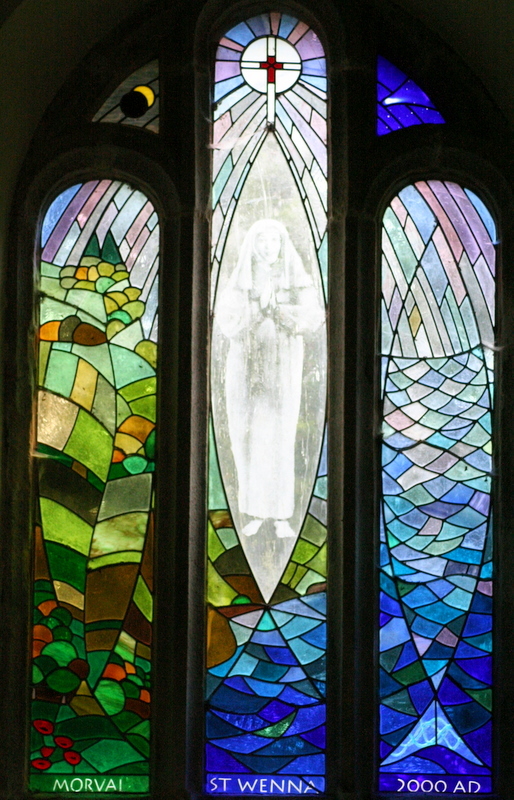 A unique theme that became prominent in twentieth-century windows in Cornwall was that of the Cornish Saints. In the absence of early documentary evidence on the lives of most of these saints,52 the designs usually took the form of an idealised figure, or an event drawn from the Saint’s legend. Early examples included St Carantoc in his coracle at sea discovering the floating altar guarded by an angel, and St Kew with her attribute of a bear53 (Figure 27). Many of the parish churches that are dedicated to a Cornish saint often included a representation in their windows, as at Constantine.54 In 1973, Martin Farrar Bell designed a chancel east window for Lelant that brought together a complex series of Cornish themes (Figure 28). The Celtic cross dominated the centre of the window, flanked by the local saints Uny, Winwaloe, Gwinear, Erth, Anta and Ia, whilst the tracery was filled with representative Cornish birds; the gull, puffin, woodcock and chough. As the window was donated by the Tyringham family, the family arms appeared in the lower section, flanked by the two country houses that they owned, down to a representation of the owner out shooting with his dog! Thus in one window are united the themes of Celtic Christian heritage, the Cornish natural world and the local family of social position. Figure 28. Lelant: Cornish saints and icons. Another uniquely Cornish element to appear in stained glass was the Cornish language. In 1938 , two new windows included Cornish inscriptions: at Carbis Bay the window included the first lines of the Te Deum,55 and at King Charles the Martyr, Falmouth, the inscription was Epscobeth Kernow: Onen Hag Oll .56 Like the Lelant window cited above, the Falmouth design included many other Cornish themes besides the Cornish inscription. The arms of the Diocese of Truro and the Duchy of Cornwall appeared, along with the fictitious arms of SS Germanus and Petroc, the main figures were four local Cornish saints, and there were also two emblematic Cornish choughs. Intriguingly, in the succeeding 70 years the inclusion of Cornish inscriptions has not been repeated in any other Cornish window. Figure 29. Redruth St Andrew: Christ in majesty. Figure 30. Menheniot: Celtic cross. A design that successfully marries Cornish themes with the Christian message is to be seen in David Peace’s etched window of 1997 at Menheniot (south aisle 4). A Celtic cross in the centre of the window is inscribed with the biblical text starting Except a grain of wheat fall ( John 12:24 ) and small panels show various stages in the growing and harvesting of the cereal. What makes this window so effective and satisfying is the manner in which the medium of etched glass enables the external setting of the church to be visible through the etching, where just outside the building in the churchyard is a stone Celtic cross (Figure 30). Figure 31. Carbis Bay: St Winwalloe. A final example of pride in the Cornish landscape and its Christian heritage is shown by comparing the windows of two designers who started with the same concept and ended with markedly different results. The concept in both cases was to frame a Cornish Saint with images of Cornish moorland and coastal landscapes. In 1990 at Carbis Bay (south aisle 2) Roy Mead designed a realistic portrayal of St Winwalloe between a modern shepherd and his flock on one side and a fisherman and his net on the other (Figure 31). At Morval (north aisle west), in response to the commission for a Millennium window, Julian George produced a central image of St Wenna that is portrayed as being so far back in time and memory as to be almost indistinct (Figure 32). Both the moors to the left and the sea to the right of Saint Wenna are highly stylised, and all three images are contained within the Christian symbol of a fish. This invites the viewer to make the connection not, as with the Carbis Bay example, in a modern context, but as a direct comment on the fifteen hundred year link between the Cornish landscape and seascape and the arrival of pre-Augustine Christianity. Figure 32. Morval: St Wenna. Given that stained glass windows have always been inserted in churches as an act of piety60 to enhance the atmosphere of worship, prayer and devotion, it has been shown in this paper that they are far more than a form of church interior decoration. Both in the late medieval period and during the Victorian Age, the subject-matter in the windows had a definite theological purpose and intention to influence the congregation’s belief and understanding. In both of these periods, windows were used by firstly the Roman Catholic church and later by the Church of England as a means of reinforcing beliefs and doctrines that were perceived as being under threat from forces within and outside the Church. The windows were, however, part of a two-way process: they expressed the nature and power of the Church as an institution as well as reflecting the many facets of society within the local congregation. Within this context, stained glass windows can be used as a tool of social history in the following ways. Anglican stained glass windows are potent indicators of social position and hierarchy within the community, particularly in the case of the landed families and the clergy. This starts with the prominent inscriptions on the windows or accompanying brass plaques. In some cases, families have also appropriated window space by being portrayed within the subject-matter of biblical and religious contexts. This is reinforced where such windows are sited in areas of religious significance within the building, thereby enabling some families of social importance over time actually to appropriate that particular space in the church. The subject-matter and iconography of memorial windows has been shown to be worthy of close scrutiny. Frequently the choice of biblical subjects and personages is an indicator of the qualities by which the donors wished their dedicatees to be remembered. This rich source of evidence is both a key to interpreting the manner in which patrons saw themselves, and also how they hoped or expected they would be perceived and remembered by the local community. A specific instance of this is the way in which war memorial windows can be used as a source to explore changing attitudes towards war and death. A consequence of the rise in demand for stained glass in the nineteenth century was that industrialised processes and marketing techniques significantly reduced the cost of stained glass, enabling a wider section of the local community to commission new windows. In the case of Cornwall, with its comparative absence of large urban centres and patronage from manufacturing and business interests, this was less significant than in many other parts of the country, but it is still a recognisable trend. Visual images and portrayals of the working classes were in the nineteenth century usually restricted to fishermen, shepherds and the occasional carpenter, all portrayed within a ‘traditional’ biblical context. It was not until the mid twentieth century that window designs regularly included working people in a contemporary context.61 In many ways this was part of a general trend to portray both the physical and human reality of the Cornish landscape and to include various symbols by which this regional pride and identity could be expressed. There has been a gradual decline in traditional Bible-based Christian iconography in twentieth-century window designs in favour of a more general symbolism. Whereas an acute biblical literacy is essential when reading and interpreting social history through Medieval and Victorian windows, the reading of many later windows depends on the identification of a wider range of both Christian and regional iconography. These conclusions are drawn from an analysis of a detailed record of all the windows throughout the whole Diocese, and it is hoped that the paper will stimulate a rigorous testing of its conclusions at parish level. The evidence enshrined in the stained glass images, together with all the more traditional sources of social history, should then contribute towards a more rounded appreciation of the social evolution of Cornish communities over the past five hundred years. This paper originated as a lecture entitled Piety, Power and Pride : a social history of Cornwall through stained glass given to the Victoria County History of Cornwall on 28th October, 2006. Secular and non-conformist stained glass was not included as part of the remit for the research. The research findings are in the form of the TRUROSEE catalogue which was compiled as part of the author’s responsibility as Stained Glass adviser to the Diocese of Truro. TRUROSEE Lanteglos-by-Camelford: South Chapel south 2: Saints Peter, Andrew and James the Great. South Aisle 2: Saints Jude and Bartholomew. TRUROSEE St Neot: s2 South Chapel east (Creation) and s3 South Chapel south 1 (Noah). TRUROSEE St Neot: n8 North Aisle west (George) and n7 North Aisle 4 (Neot). TRUROSEE St Neot: n4 North Aisle 1 ( Ralph Harys made this window ). A full discussion of this is in J. Mattingly Stories in the glass—reconstructing the St Neot pre-Reformation glazing scheme in Journal of the Royal Institution of Cornwall (JRIC) 3rd series, 3, (2000), p 20. TRUROSEE St Neot: n5 North Aisle 2 (Wives of the Parish); n6 North Aisle 3 (Young Women of the Parish); n7 North Aisle 4 (Young men of the Parish). See also J. Mattingly The Medieval Parish Guilds of Cornwall JRIC New series, 10 (1989) pp 290–329: p 307 deals with the St Neot guilds. Painton Cowen English Stained Glass , (London, 2008), p 24. This is a general figure for the whole country. There are medieval fragments in nearly fifty Cornish buildings. The survival of the St Neot windows is explained in J. Mattingly Stories in the glass—reconstructing the St Neot pre-Reformation glazing scheme , pp.9–10. TRUROSEE St Neot: w2 Internal Tower screen by Minster Glass, 2004. TRUROSEE Old Kea Church: South Aisle west window of the armorials of the Seton, Daubuz, Peebles, Gilbert, Murray and Vautier families by Gibbs, 1863. Old Kea is the name used by the Diocese of Truro for the 1853 church (enlarged in 1862) by William Clemens of Truro, built next to the ruined tower of the medieval church, and to distinguish it from the 1892 All Hallows, Kea parish church by G. Fellowes Prynne. Martin Harrison, Victorian Stained Glass (London, 1980), p 20. Peter F. Anson, Fashion in Church Furnishings 1840–1940 (London, 1965), p 88. G.W.O. Addleshaw and F. Etchells, The architectural setting for Anglican worship (London, 1948), pp 203–222. Nigel Yates, Buildings, Faith & Worship (London, 1991), p 134. TRUROSEE Penzance St Paul: the total cost of the windows was £400. TRUROSEE Par Biscovey, all windows, 1849 and Devoran, all windows, 1857. TRUROSEE Maker: The Edgcumbe Aisle south 1, 1882 and south 2, 1882. TRUROSEE Kilkhampton: South Chapel south 1 and south 2, North Chapel north, all by Clayton & Bell, 1860s. Revd John Armstrong, ‘Monuments’ in Transactions of the Exeter Diocesan Architectural Society Vol 2, October 1843, p 11. Michael Kearney, ‘The Victorian Memorial Window’ in The Journal of Stained Glass , vol 31, (2007) The British Society of Master Glass Painters, pp 66–93. Paul Sparling Stained glass in Rutland Churches , Rutland Local History Society, 1997, pp 17–26. TRUROSEE Little Petherick: South Aisle 1, 1867: Acts 19:36. TRUROSEE Maryfield: North Transept north 2 by Clayton & Bell 1866. TRUROSEE Illogan: Tower west, 1889 and North Aisle 1, 1900. TRUROSEE. The actual figures are 175 windows dedicated to members of the clergy and 83 donated by the clergy, out of a total of 1,183 memorial windows in the Truro Diocese (this does not include windows dedicated to members of clergy families). Over three-quarters of these were inserted in the fifty-year period 1860–1910. TRUROSEE St Merryn: North Aisle 1 by Leonard Pownall, 1925: Matthew 25:21, the Parable of the Talents. The archangel is usually associated with healing; St Luke was termed ‘the physician’, and St Peter performed healing miracles in Acts. St Michael’s Mount chapel: Chancel south 2 by Lavers Barraud & Westlake, 1878. TRUROSEE St Columb Minor: North Aisle east by Gibbs & Howard, 1887: Mark 10:14 and Luke 18:16. TRUROSEE Tresco: South Nave 3 and North Nave 3 by Charles Eamer Kempe, 1879. There are many examples of the wheatsheaf and tower rebus in Cornish windows, one being St Mary’s Aisle of Truro Cathedral, chancel east, 1911. TRUROSEE Marazion: North Aisle 2 by Lavers Barraud & Westlake, 1875, and TRUROSEE East Looe: West by Lavers, Barraud & Westlake, 1892. 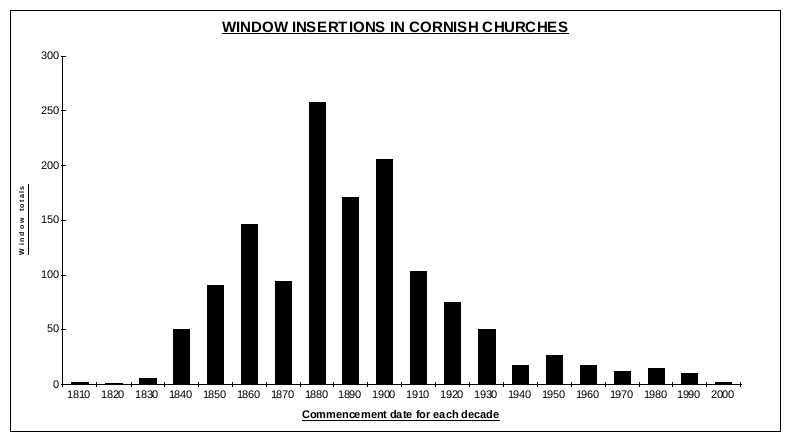 Willement charged £400 for the windows in St Paul’s, Penzance in 1843 (J Polsue, A Complete Parochial History of the County of Cornwall , vol 3, p 233. William Lake, Truro, 1870). By 1891, two windows were inserted at Lostwithiel for £30 each (Truro Diocesan Kalendar,Truro, 1891 p 173), and large windows at Truro Cathedral in 1905 cost £75 (Cornwall County Record Office TCM/578). TRUROSEE Michaelstow: Chancel east by Louis Davis, 1906. Family information from Andy Muir of St Tudy in private correspondence. John Ruskin The Seven Lamps of Architecture , p 10 footnote, George Allen, Orpington, 1880. TRUROSEE Boconnoc: North Aisle west, dedicated to Lt Col Cyril Dudley Fortescue died, 1890. TRUROSEE St George occurs fourteen times and St Michael in nine windows. TRUROSEE The Crucifixion appears in six windows and the Resurrection in five. TRUROSEE St Stephen, Launceston: Chancel east by Percy Bacon Bros., 1920. St Stephen-in-Brannel: Chancel east by Wippell (designed by George Cooper-Abbs), 1946. St Eval: South Aisle east by Crear McCartney, 1989. TRUROSEE Treverbyn: North Aisle 1 by Wippell, 1927 and Paul: Chancel east by Robert Anning Bell, 1917. TRUROSEE Egloshayle: North Nave 1 by John Hall, 1956, and Lelant: South Aisle 2, 1922. The names are recorded on a memorial in Truro Cathedral, south aisle west. TRUROSEE St Cleer: South Aisle 1, 2, 3 by Fouracre & Watson, inserted in Draynes Mission Church 1888. The Church in the West 25th August 1888. TRUROSEE St Stephen-in-Brannel: Chancel east by Wippell (designed by George Cooper-Abbs), 1946. Cornwall County Record Office (CRO) TCM/145 Benson Diaries 1871–1881, 11th November 1877. Birkin Haward, Nineteenth Century Suffolk Stained Glass , (Woodbridge, 1989), p 18, and Nineteenth Century Norfolk Stained Glass , (Woodbridge 1984), p 24. See also Michael Kearney The Victorian Memorial window p 91 footnote 63 for a different interpretation. TRUROSEE Falmouth, King Charles the Martyr: South Aisle 1 by Wippell, 1938. TRUROSEE St Merryn: Chancel east by Wippell, 1934, and Par Green: Chancel east by Francis Stephens, 1954. TRUROSEE notably at Truro Cathedral: North Nave Aisle 12 by Clayton & Bell, 1903. Other examples are at Kilkhampton, Par Green, South Hill, St Erth and St Ive. TRUROSEE Newlyn: West, 1899, and Landulph: South Chapel east by Fouracre & Son, 1913. Bishop Wilkinson & Canon A.J. Mason The Cornish See & Cathedral , Heard & Sons, Truro, 1887: pp 44–50. This volume was published for the consecration of the Cathedral and, although no author is cited, it is credited with ‘the authority of the Dean and Chapter’. The Dean was Bishop Wilkinson and Canon Mason, the Canon Missioner, was instrumental in the evolution and implementation of the window scheme from 1887 onwards. CRO TCM/546 and 547: correspondence between Canon Mason and Chancellor Worlledge. TRUROSEE Truro, St Paul: Chancel east, Vestry east and Vestry south 1 and 2 by Lavers, Barraud & Westlake, 1884. TRUROSEE Newquay: South Chapel 1 and 2 by John Hardman, 1914. The Truro Diocesan Kalendar 1915, p 263 lists the whole projected scheme. Nicholas Orme Cornwall and the Cross: Christianity 500–1560 (Chichester, 2007), p 5. TRUROSEE Crantock: South Nave 2 by C.E. Tute, 1904, and St Kew: Chancel south, 1911. TRUROSEE Constantine: South Chapel east by John Hall, 1973. TRUROSEE Carbis Bay: Chancel east by Wippell, 1939. TRUROSEE Falmouth, King Charles the Martyr: South Aisle 1 by Wippell, 1938. Inscription in Cornish of ‘Bishopric of Cornwall : One and All’ beneath the arms of the Truro See and the County of Cornwall. TRUROSEE St Just-in-Penwith: South Aisle 3 by Clayton & Bell, 1928. TRUROSEE Redruth, St Andrew: Chancel east by William Glasby 1938. Also Redruth St Euny: South Aisle 3, 1963. TRUROSEE Constantine: South Chapel east by John Hall, 1973, and Carbis Bay: Chancel east by Wippell, 1939. Richard Marks Image and devotion in Late Medieval England , (Stroud, 2004), p 161 quoting L.E. Boyle, ‘Popular piety in the Middle Ages: What is popular?’ Florilegium , 4 (1982), pp 184–193 ‘Piety itself is the expression of gratitude in one way or another for a faith that is held by the believer as a gift from the one in whom one believes’. TRUROSEE Cardinham: Chancel east by Christopher Webb, 1948, shows all these occupations in a contemporary context.